Rajasthan, often referred to as India’s most colourful state, is home to some of Asia’s most luxurious rooms and suites. Luxury Rajasthan hotels are typically inspired by the regions rich royal heritage, evoking an atmosphere of kings, princesses and fairy-tales. Wonder at the mesmerizing Taj Mahal in Agra, stare into the shimmering waters of Lake Pichola in Udaipur, and ponder at the grand Mehrangarh Fort in Jodhpur; all from the comfort and privacy of your luxury suite. The opulent Raas is located in Jodhpur. Jodhpur is also known as Rajasthan’s ‘Blue City’, as the sea of old houses surrounding Mehrangarh Fort are washed in a vibrant sky blue. Raas is bursting with charm, comprised of four charismatic buildings crafted from Jodhpur’s very own ‘rose-red sandstone’. The oldest of the buildings was built in the 18th century, and features intricately carved stone panels – the hallmark of Rajasthani architecture. The Raas’ Heritage Suite sits in an original 18th century Rajput residence. It combines authentic antiques and fixtures with a fresh and modern interior. 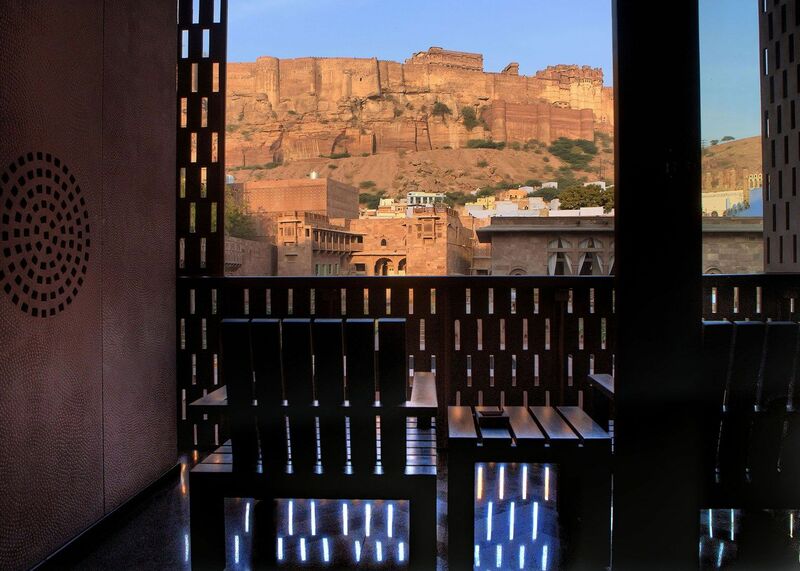 The private terrace offers breath-taking views of Mehrangarh Fort. Your sightseeing and exploration of Jodhpur City needn’t end when you return to the hotel; get lost in the fascinating views of the Blue City from your Luxury Room, Duplex Suite or Heritage Suite. The Taj Lake Palace is one of Rajasthan’s most famous luxury resorts, and is located in the middle of Lake Pichola. It appears to float on the shimmering waters, evoking an atmosphere of dreams and fairy tales. 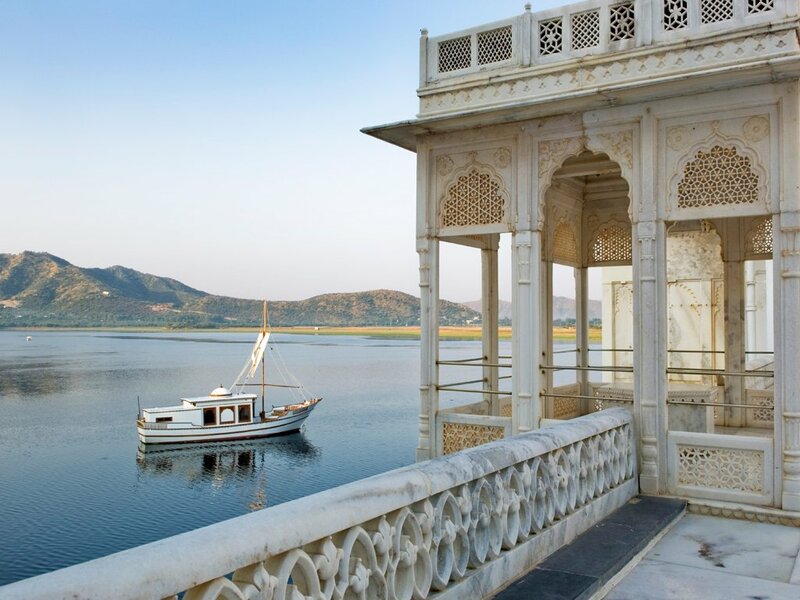 Royal Suites at the Lake Palace certainly live up to their name. With delicate and intricate hand-painted frescos, the room itself is almost more spellbinding than its view. Royal Suites offer panoramic views of Lake Pichola, even from the bathrooms. A favourite feature of the Royal Suites are the extra sitting areas, with stunning views of what is arguably the best lake sunset in the world. 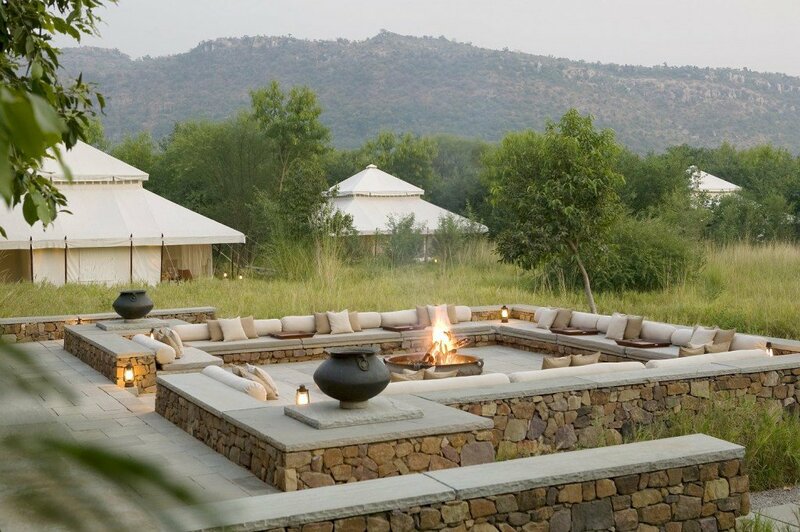 Aman-I-Khas is nestled on the edge of Ranthambhore National Park, one of India’s very best tiger reserves. There are just ten luxury tents at Aman-I-Khas, each looking out on endless forest and untouched natural beauty. The exceptional views are easy to get lost in, as you gaze into the seemingly endless greenery and rolling Aravali mountain range. As well as a perfect view, each tent is draped in fine cotton, and has a separate sleeping area, dining area and dressing room. Whilst staying at the Aman-I-Khas, guests are treated to a private butler service to attend their every whim. The surroundings are so exceptional, that even Katy Perry and Russell Brand got married here in 2010. Although not in Rajasthan, the Taj Mahal is located in the neighbouring state of Utter Pradesh, and just a short drive from capital of New Delhi. Agra is home of the magnificent Taj Mahal, the world’s favourite monument to love. Every room at the luxurious Oberoi Amarvilas provides a private view of the Taj Mahal. Premier Rooms, with spacious marble bathrooms and free standing bathtubs, have a view of the Taj Mahal from an elaborately cushioned bay window. Deluxe Suites offer a panoramic view of the landscaped gardens and cobalt blue pool, with the Taj Mahal looming beyond. 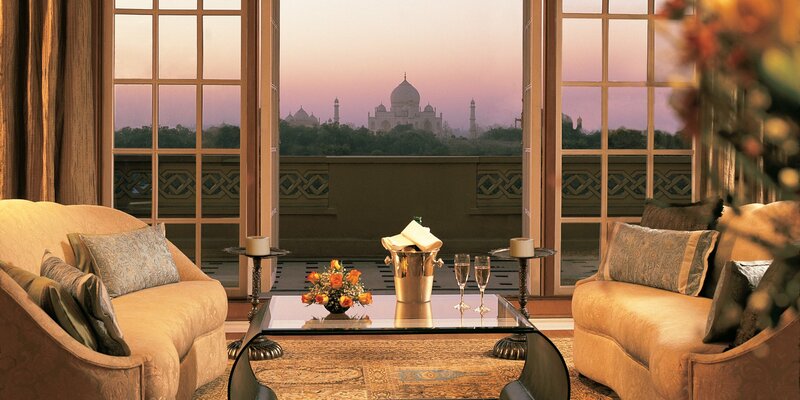 The Luxury Suite features two private open air terraces, each with spectacular views of the Taj Mahal. Luxury Suites are located on the highest floor of the resort, and even the bathroom boasts a splendid view of the monument. Gaze at the Taj Mahal without the restriction of visiting hours or crowds. Watch the sunrise over the Taj as the bright white marble glows a peachy pink; an impossibly romantic experience and a highlight of any luxury India tour.